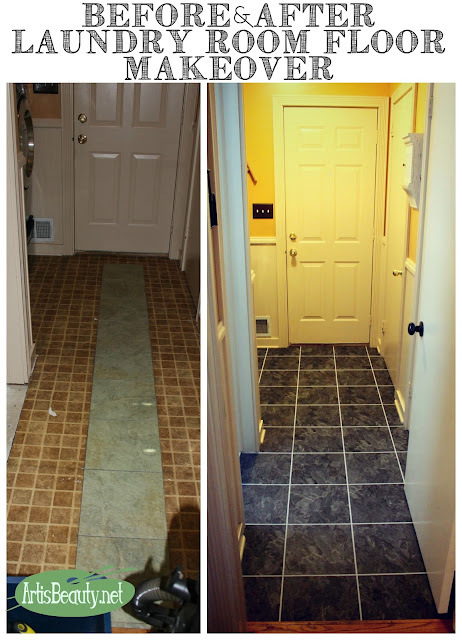 ART IS BEAUTY: Before and After Laundry Room Floor Makeover "the RUNWAY"
Before and After Laundry Room Floor Makeover "the RUNWAY"
Good Morning again my BEAUTIES! 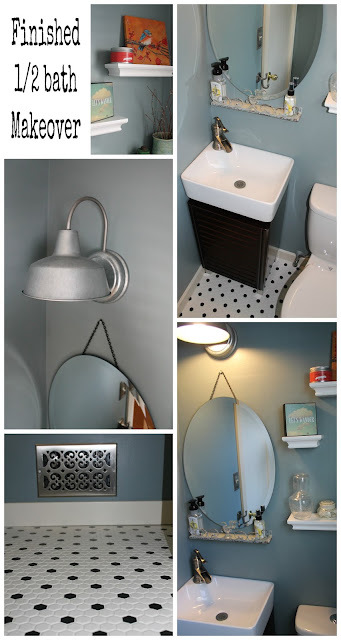 I have a fun and pretty quick little makeover project to show you this morning. Our latest project used sticky tiles. You see this part of the floor is what we like to call....THE RUNWAY! and the half bath. It contains one coat closet and the cleaning supplies closet. It is a very very busy area. When we had originally discussed the bath makeover we were planning on continuing on the tile from the bath into the hallway. you know how long the process takes. You have your subfloor you have to lay..then you have to cement your tiles in..
then you have to grout the tile..then seal the tile and wait 3 days for the sealer to cure. How long do you think we could go without using this hallway??? Are you catching my drift. Having a family of six..he knew that just one day missing laundry to move the machines out was going to create an enormous back up of laundry...plus getting our front loaders in and out into the garage was really not a fun thing he wanted to think about so we had to go back to the drawing board. Now when we had first moved into our house almost 20 years ago we had changed this floor. Even back then we had used a very good sticky tile. So good in fact it did NOT want to come up. While starting this project we had to keep a row of the OLD tiles down in the middle so we could keep using the runway until we were ready to start laying tiles. and you can see more live broadcasts. Once all the old tiles were up we were able to start laying the new tiles. I should mention before we started we popped off all the shoe molding so that when we were done we could pop it back on and give a cleaner look to the tile. We found the center of our floor and stared laying the tiles out from there. covered the floor to protect it and just popped the machines forward.. Things I had been going crazy looking for had mysteriously ended up behind the washing machine! we cleaned out the dryer vent tube and all the other good stuff that likes to go behind appliances and got to work on the floor behind there. finishing behind the dryer and getting ready to put the shoe molding back on. finish the couple compound cuts that had to be made along the wall and we would have our runway back in RUNNING order. Here is looking down the runway to the garage door. 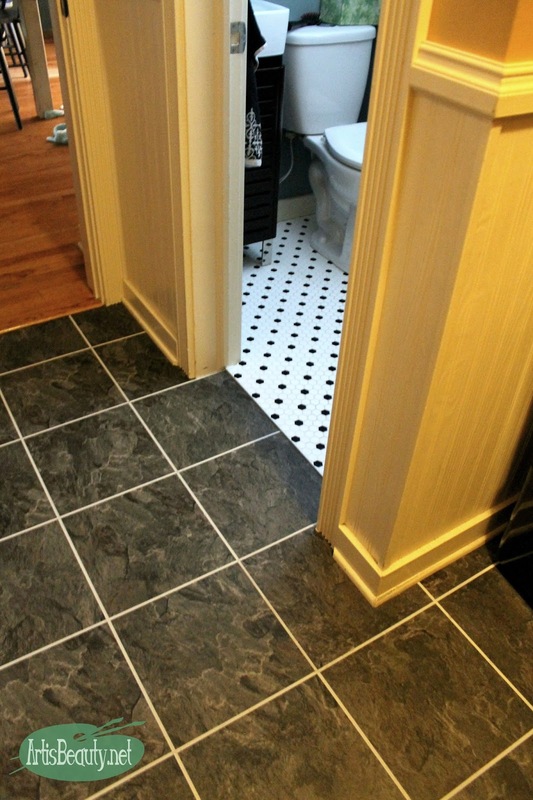 We just used a very thick high grade sticky tile from one of our local home stores. 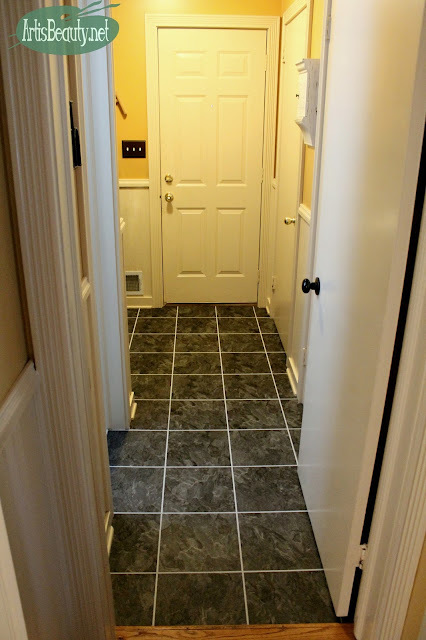 It has the grout line built in but you can also choose to grout on top of that too. I am so happy with the difference and the fact that it really only took one full day to complete. 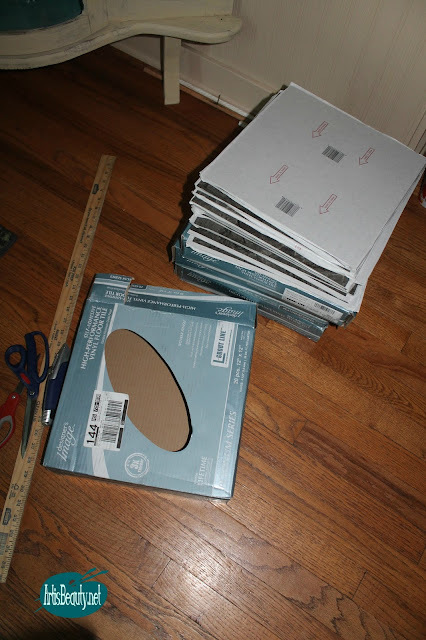 The only tools we needed were a very sharp utility knife, some scissors and a straight edge. I hope you enjoyed this fun makeover and that you are having a fabulous summer.